Valorous Halcyon: Changes Start Today! Is there anything in life you want to take action, only to find yourself keep procrastinating? Or maybe you really want to do that one thing but has been giving yourself tonnes of excuses? Out of plain laziness or maybe fear and lack of confidence? Maybe you haven't been liking your job for years and you still stuck with the same old boring job? On a lighter note, maybe you have been telling yourself to go exercise but you always get bogged down by last minute "unexpected events". Then the sense of guilt crawls in. The thing is, if we don't start doing it now, we will never start. It's true that the first step is always the hardest, but if only you take the leap of faith and take the first baby step, you will start seeing breakthroughs. 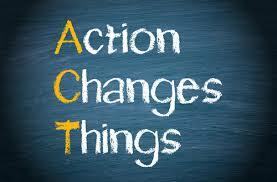 The key here is TAKE ACTION! The change does not have to be significant, in fact many changes have a humble start, aligned with my 1% improvement every day. I have been telling myself to eat more heathily, but I have been giving myself excuses! I still love eating the cholesterol-rich nasi lemak (coconut rice) for breakfast, or Mocha ice blended after lunch meal. I have been telling myself to start preparing my own lunch, because the food sold in my workplace's cafetaria are not that healthy. But what happened? I still continued to eat half rice with a portion of meat (usually lamb) and another portion of vegetables (long beans or spinach), for lunch. I still continue to indulge in Nescafe Milo drink (instead of a more expensive Mocha ice blended). For breakfast, I still continued to eat fried rice or fried mihun, and an egg or scrambled eggs. Rich in carbs and proteins, but oily. Just yesterday there was a number of health booths set up to offer the Bank staffs free checkup on blood glucose level, blood pressure, cholesterol level, fat percentage, BMI and so on. I went and checked up, and here're the results! 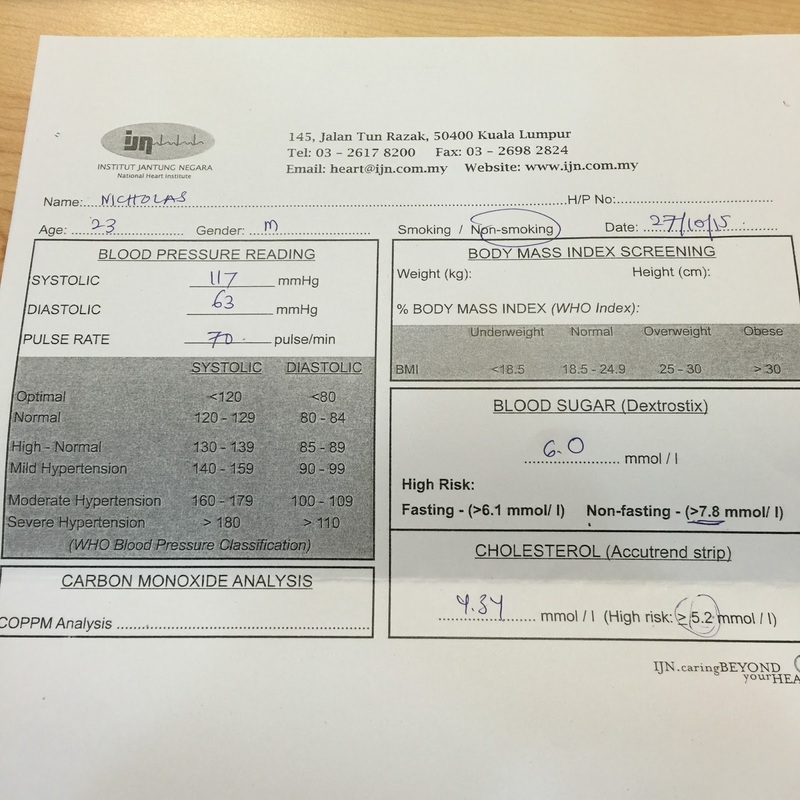 Thank God my cholesterol level, blood pressure and blood glucose level are all normal. But I'm still fat. 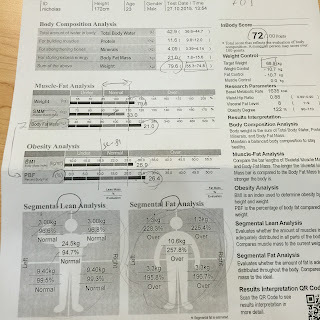 Average muscle mass but above average fat level. Maybe the machine was faulty. I tried to give myself one thousand excuses. I even tried to argue with the girl who interpreted the figure, saying the possibility of the muscles being mistaken as fats. Eventually I concurred. There's no point feeling bad about it because this is the fact. Feeling discouraged doesn't help, taking action does! 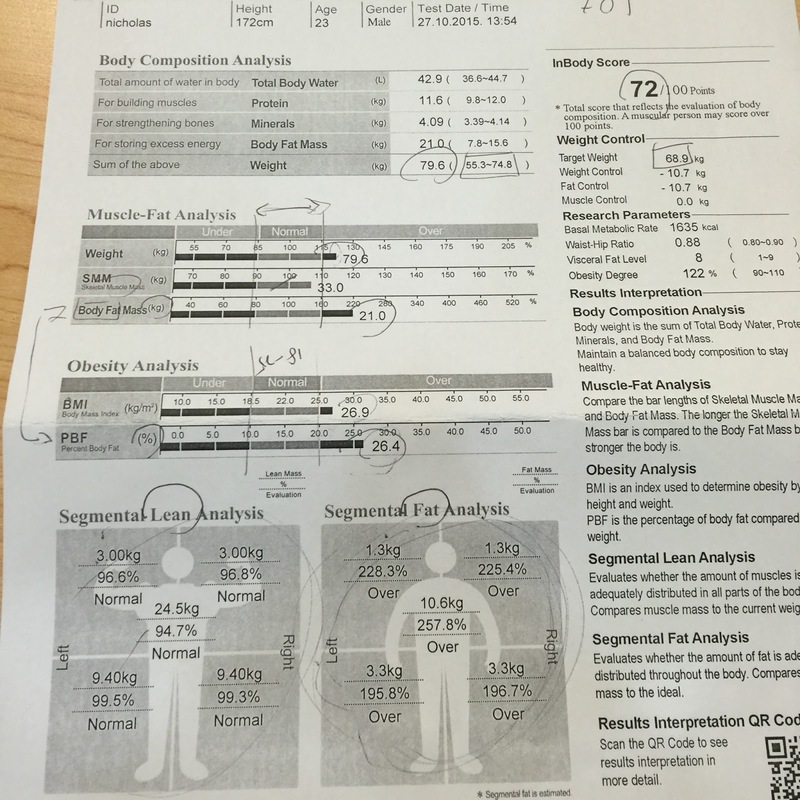 One comforting thing about the result was that my fitness level scored 72%, 2% above the benchmark. If one's score is above 70%, one is considered fit. This didn't come as a surprise to me because I have been frequenting gym for the past two months. So what is the change I can start implementing to improve my fitness level even more? Reducing weight is definitely one way! Controlling what I eat and reduce the portion of food intake. In fact, if you use a small plate/bowl for meals, you will eat lesser. This morning, I ate differently. Instead of fried rice/fried mihun I normally eat, I ate scrambled eggs together with baked beans. 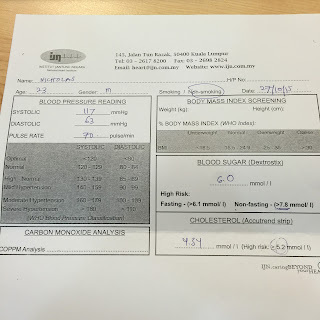 Result: I did not feel as bloated as I would have had I eaten fried rice. Maybe I should try eating oats instead tomorrow, or congee. Maybe it is your personal finance you need take control on. You may not have created balance sheet to track every expense, and your money seems to go missing by the end of month. You know you should create a balance sheet, but you keep procrastinating. A small change here is this: JUST DO IT! Create a balance sheet doesn't take you more than 10 minutes. You can start by writing what you have spent on this week alone, and start keeping track of your cash outflow today! By the end of the month you will have more clarity on where you spend most of your money on, and from there trim down your unnecessary expenses. One way to start having savings is by paying yourself first. Set aside the amount of saving from your paycheck first and never to touch it. Maybe you have been having an issue with your relationship matters. Relationship with your friends and family may be deteriorating as you get busy with work or life in general. Why not take some quality family time to bond with each other? Or why not catch up with a dear friend whom you have not been keeping in touch for some time? Meet up with them and have a coffee. You will be glad you do all these at the end of the day, to know how are your friends doing or issues bothering your family members. Maybe you have been feeling very stressful these days due to workloads that can't seem to stop piling up, and you don't know what you can do to alleviate stress. But it doesn't have to be that way. How you start your day would define the rest of your day, sounds familiar? If you start your day right, you will have sufficient energy to complete the tasks of the day. Instead of thinking how much more work awaiting you in the office, take 5 minutes off from the moment you open your eyes to be grateful! Of your loved ones, family, job, your ability to wake up and live another day, your warfree nation and everything you can think of. Just spend 5 minutes to think of things to be thankful of, and you will have a very different start of the day. You will appreciate things more, than taking them for granted. up feeling all bubbly and talkative. I tend to wake up being grumpy and quiet. And I do this one thing: read quotes. Any quote that can encourage and edify you! It can be Bible verses, inspiring quotes, or quotes specifically catered to your personal interests. Quotes that can make you think and reflect. Quotes from some famous people. I do my devotion every morning, spend time reading Bible verses and speak to God. Maybe you have a different way, do it! Reflect on your goals and motivations. Reflect on why you are doing what you are doing, and what initially motivated you to do so. This would realign your goals and pull you back from possible deviations to the right track. You can be driving to work or commuting via different means of transport, and reflect on things you don't normally take time to ponder on. Reflect on the purpose of life, for instance. Let your reflections run wild! You wouldn't know what are the things your mind will subsconciously tell you in reflection.